Once you’ve parked in one of our downtown Gatlinburg lots, getting around town is a breeze. Much of what’s on your itinerary for the day may be within easy walking distance. But for destinations that lie beyond that limit, we recommend using the Gatlinburg trolley system, which can get you anywhere you’re going in town – and even Dollywood and Great Smoky Mountains National Park – for an affordable fee. Red Route - Serves River Rd. and other downtown destinations. Runs year ‘round. Departures every 30 minutes. 50 cents. Green Route – Serves Parkway destinations. Runs May through December. Departures every 30 minutes. 50 cents. Yellow Route – From downtown to Great Smoky Arts & Crafts Community and back. 1-hour trip. Runs April through December. $1 all day. Tan Route – From downtown to Great Smoky Mountains National Park and back. 1.5-hour trip. Runs June through October. $2 round trip. Pink Route – From downtown to Dollywood and back. 1- to 1.5-hour trip. Runs when Dollywood is open. $1 each way. Blue Route – From downtown to Gatlinburg Community Center and back via East Parkway (U.S. 321 East). Runs year ‘round. Departures every 45 minutes. 50 cents. 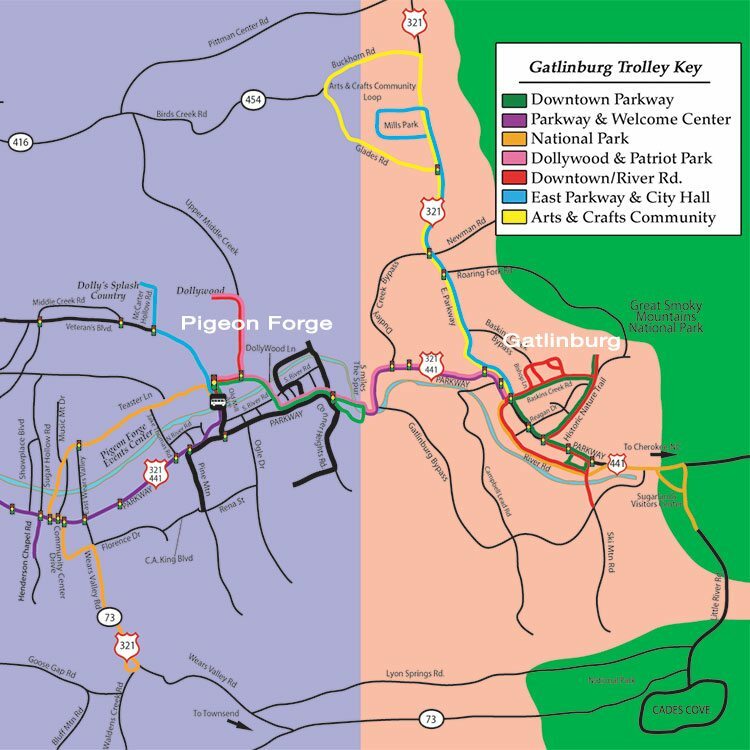 Purple Route – From downtown to the Gatlinburg Park-N-Ride lot at the Gatlinburg Welcome Center on The Spur. Runs year ‘round. Departures every 30 minutes. 50 cents.